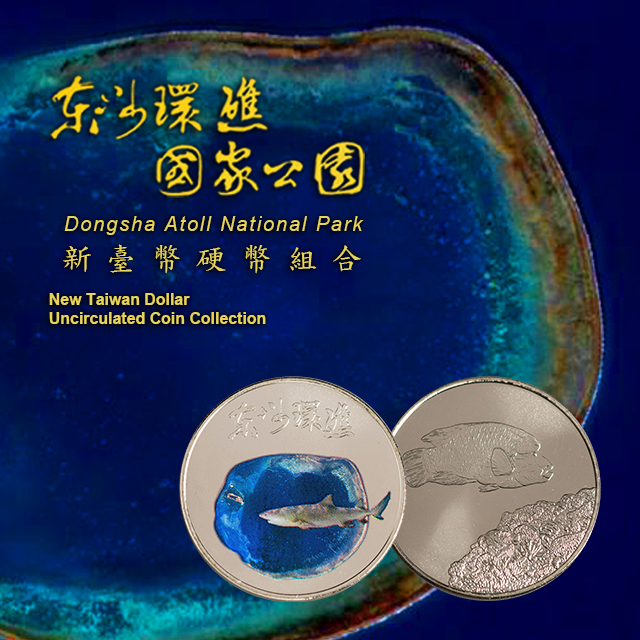 The Central Bank of the Republic of China (Taiwan) will issue the seventh coin set of the National Parks of Taiwan series, Dongsha Atoll National Park, on November 15, 2018. The Central Bank has delegated the Bank of Taiwan to sell the coin sets to the public on a first-come, first-served basis, limited to one set per purchaser at a time. A total of 25,000 coin sets will be issued. Each set costs NT$400. This coin set consists of five coins, NT$1, NT$5, NT$10, NT$20 and NT$50, as well as a commemorative medal bearing a colored image of Dongsha Atoll and Lemon Shark on the obverse, and an image of Humphead Wrasse on the reverse. This coin set showcases the Dongsha Atoll National Park and various natural and cultural wonders within, such as Dongsha Island, Island Lagoon, Dongsha Historic Site, Shield of the South China Sea, and Yue-Ya Shiuan. It also depicts biological diversity of sea life in the park. We are grateful to the Marine National Park Headquarters for examining the symbols and literature used in the preparation for the issuance of this coin set.